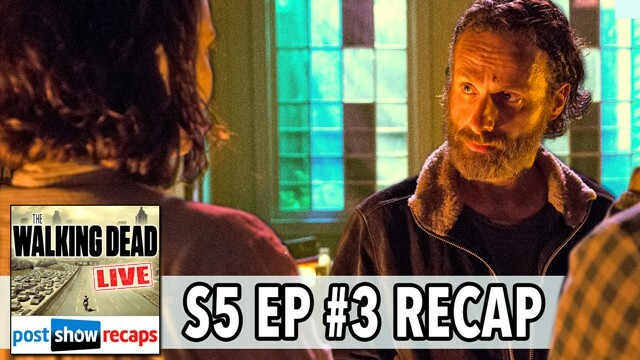 LIVE at 10:15 pm ET / 7:15 pm PT, Rob Cesternino and Josh Wigler recap The Walking Dead Season 5, Episode 3 entitled, “Four Walls and a Roof”. Join us for our live review immediately after the episode. 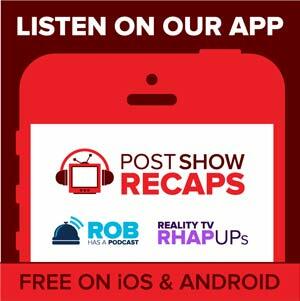 How do Rob and Josh react to the death of Bob? What exactly was Gareth’s plan for Rick and everybody? How did Rick know to come back to the church? Did they know that Gareth was coming back? Who did Daryl return back to the church with? How was Bob’s “Tainted Meat” speech different in the television show than it was in the comic books? Would Gareth and the other people from Terminus get infected with the virus had they lived? Can Rick trust Gabriel after his “confession” at the church? Was Abraham correct to try and get Eugene out of the church? Should Rick have waited at the church for Daryl and Carol to come back? Should Sasha have left Bob’s side in his dying moments to go and get revenge on Gareth? How happy was Josh to see Michonne reunited with her sword? What do we think is going to happen next week with Beth? Was it right for Glen and Maggie to head to Washington, D.C. with Abraham? What was the meaning of the letter “A” that was seen outside the church?